Following the confirmation of xRapid’s upcoming launch, and diversification into further sectors, the price of Ripple (XRP) surged to USD 0.77 during the week, at one point overtaking ETH as the second largest cryptocurrency by market cap. xRapid, scheduled for launch in October, is a payment solution facilitating real-time settlements with its native XRP token to provide on-demand liquidity. This can significantly lower liquidity costs of payments, especially in emerging markets where the need for pre-funded local currency accounts to facilitate payments results in high liquidity costs. Another potential key driver of the surging XRP price is the increasing adoption of XRP’s existing product, xCurrent. Compared to xRapid, xCurrent aims to minimize settlement costs by enabling instant cross-border settlement among participants in RippleNet, and the native token XRP is not required in the settlement process. PNC was confirmed as the most recent addition to RippleNet this week, with its commercial customers now being able to receive real-time payments from overseas banks. This further consolidates XRP’s leading adoption in the financial services industry, with more than 120 banks and financial institutions having joined RippleNet to date. News regarding xRapid and xCurrent were joined by a slew of other announcements surrounding XRP this week. Founded by Stefan Thomas (Former CTO of Ripple Labs), Coil announced that content creators on YouTube and Twitch can now accept XRP payments from subscribers using a browser extension. Starting with social media payments, we can see that the use of XRP is being diversified towards micropayments, which may pave the way for XRP mass adoption. Furthermore, the National Commercial Bank (NCB) of Saudi Arabia announced joining RippleNet, and we further expect that competition in seizing the remittance market in the Middle East will be intensified between XRP and Stellar (XLM). This NCB partnership enables wider adoption of XRP with NCB’s 5.4mn customer base and the SAR 34bn (as of Q1 2018) Saudi Arabian remittance market. We believe that the theory of “buy the rumor” can be applied to XRP’s surging price. 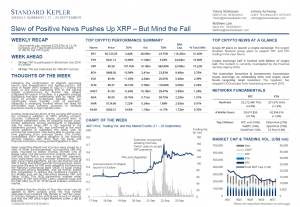 We may further speculate that investors may decide to “sell the news” in October following the anticipated launch of xRapid, and that the XRP price might therefore suffer a dip at that time. Standard Kepler is Asia's leading blockchain financial services provider, offering market changing research insights, in addition to holistic advisory, brokerage, and custodian services. We take great pride in being able to offer professional services that are trusted for our honesty and driven by technology. Headquartered in Hong Kong, Standard Kepler’s management team previously served in JP Morgan, Macquarie Capital, State Street, and KPMG.